It should. The average business gets 80% of their new clients and sales through personal referrals. It doesn’t matter what type of industry you’re talking about, personal referrals drive the bulk of new business. And yet, the entire process of facilitating and tracking word-of-mouth referrals is still pretty much where it was 100 years ago: paper cards, written correspondence and people’s memories. Even with the Internet, email and contact management tools like Constant Contact or SalesForce, most companies are still staring into a black hole when they try to understand what happens to business cards – or any other collateral they create – after the initial hand off is completed. It makes evaluating the ROI for those materials – or for the events at which they were distributed – extremely difficult. As the owner and president of Seibert Insurance, an independent insurance agency in the Tampa Bay area, I’ve always understood that word-of-mouth referrals are incredibly important to my business. I knew there had to be a better way to track, evaluate and increase the effectiveness of my word-of-mouth referral marketing efforts. When I discovered SavvyCard, I realized I had finally found a tool designed specifically to help me do all of the above. 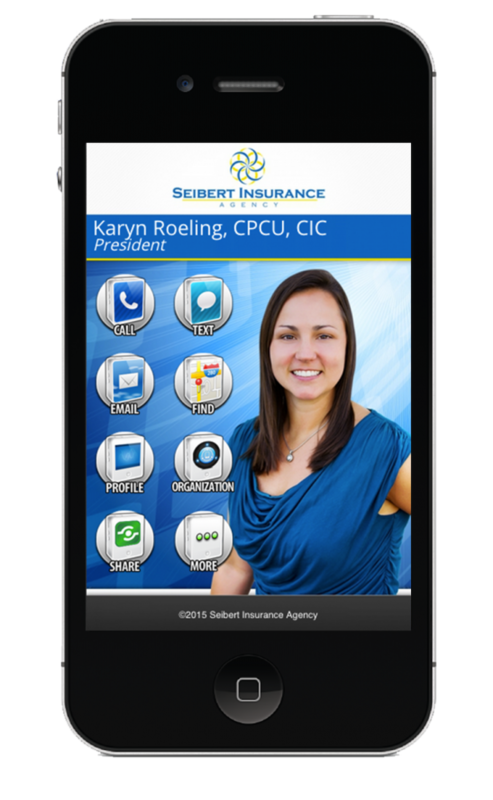 I started using SavvyCard for Seibert Insurance back in 2011. For many years now, SavvyCard has not only enabled me to grow my business, but it has given me much better visibility into the ROI I get on different events I do to promote my business. Not only is it a great new way to network and hand out business cards (which you never run out of, by the way), it’s a powerful lead tracking system, too. Let me give you an example of how SavvyCard works for me in my day-to-day business. Let’s say I am at a networking event and meet Joan. Joan tells me she needs a plumber to fix a leak at her house. I just so happen to be prospecting a company that does plumbing and has a great reputation (and a SavvyCard) so I proceed to send Joan the SavvyCard of Prospect Plumber Inc. Prospect Plumber Inc. receives a message that I just sent his SavvyCard to Joan as well as Joan’s contact information so he can follow up with her in real-time, which impresses Joan. Prospect Plumber Inc. also sees that Karyn Roeling from Seibert Insurance was the person who referred his company to Joan. And I get a notification that I facilitated this introduction. I don’t know about you, but when someone refers me to another person or business, all I do is look for business I can refer them as a “Thank You’ for referring me. In addition to helping me by referring me to his contacts, Prospect Plumber Inc. will most likely ask me to write his business insurance because I promote and refer him, too. All around, this is a win-win-win situation: Prospect Plumber, Inc. and I are actively working as salespeople to promote each other’s business, and we can see exactly what the other is doing, in real-time. We’re getting the contact info from each other for new referrals immediately so we can follow up quickly and impress these new prospect customers with our responsiveness. And, Joan is getting a pre-vetted and trusted vendor to help with her specific needs – a vendor who reaches out to her directly and who knows someone in common with her. This increases her confidence in this new vendor right off the bat and results in higher close rates (and better ROI) for the vendor. And the best part? If Joan has a great experience and refers Prospect Plumber, Inc. to one of her friends using his SavvyCard, Prospect Plumber, Inc. is notified immediately that this share has taken place and gets all the new prospect’s contact information as well as information on who did the referral – in this case Joan – so he can reach out quickly to the new prospect and track that share BACK to me, Karyn Roeling. If Joan refers my business to a friend of hers by using my SavvyCard, I can track that referral back to the event I met Joan at. At any point, Prospect Plumber, Inc. and I can access our SavvyCard accounts and get a detailed reporting of all this information over the months we’ve been working together. That is some seriously cool insight that helps my vendor partners and I gather laser-accurate ROI numbers on activities we do to promote our own companies, and each other’s, too. SavvyCard has helped my business grow because of situations just like this one. Passing a SavvyCard not only has the “I’m technologically advanced” feel to it, it allows you to close more deals and to make insightful, informed decisions on where to increase your referral marketing efforts, and where to cut them. It’s referral marketing intelligence that hasn’t existed before, and I’ve used it to great effect for increasing the ROI on my promotional activities. To contact Karen with any insurance inquiries, please visit her SavvyCard.